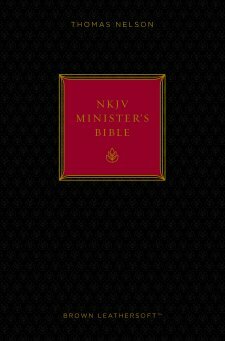 Published by Thomas Nelson is a brand new, basic bible, perfect for a minister or anyone who may find themselves pastoring to others. Enclosed in a a cardboard gift box, this leatherette brown covered bible is pretty much a standard bible ministers' helps in between the new and old testaments. The helps include funeral services for a variety of circumstances, weddings, visiting the sick, spreading the gospel message and a format for delivering the message when making sick visits to either homes or hospitals. While this bible would not replace a seminary course on how to pastor or minister a congregation, there are selected helpful passages for common services such as weddings, funerals and sick visits enclosed. Considering I am not involved as a pastor or minister I cannot say how useful this bible actually is. I believe for the layman who finds themselves involved in making a sick visit or assisting with a wedding or funeral this would be a good resource. I imagine for an actual minister or pastor, the resources included barely scratch the surface of the responsibility entailed. Other than the helps, the interior is a basic NKJV of the bible. There are no additional notes or expansions on the bible text itself. Most likely this is to keep the bible down to a small, portable size for actual use in public service, bible study and visits. As a blogger I received a copy of this bible for the purpose of writing this review.